Normally, on the first Sunday of each month, I feature a student illustrator or someone debuting a picture book. Today’s illustrations are from the acclaimed illustrator Gennady Spirin, who is hardly new to children’s lit. In fact, he’s received five gold medals from the Society of Illustrators; he has been awarded First Prize for Illustration at the Barcelona International Children’s Book Fair, as well as the Premio Grafico at the Bologna Children’s Book Fair; he received the Golden Apple of the Bratislava International Biennale of children’s book illustration; and on four different occasions his work has been placed on the New York Times Best Illustrated Books list. But last Sunday, I featured a debut artist, the talented Eliza Wheeler. 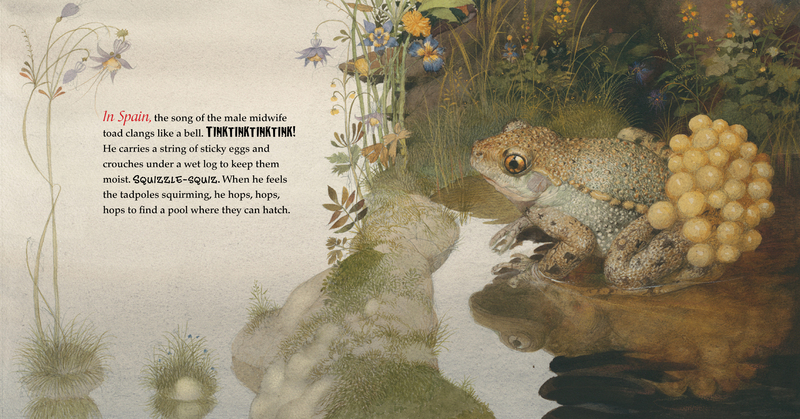 And today I can’t help but show Spirin’s illustrations from Brenda Z. Guiberson’s Frog Song (Henry Holt, February 2013). Know why? The book is, as Pamela Paul wrote at the New York Times, “nothing less than a springtime reverie.” And I don’t know about your neck of the woods, but Spring has finally sprung here—warm temps and all—and I feel like celebrating today. Spirin’s finely-rendered illustrations are exquisite. 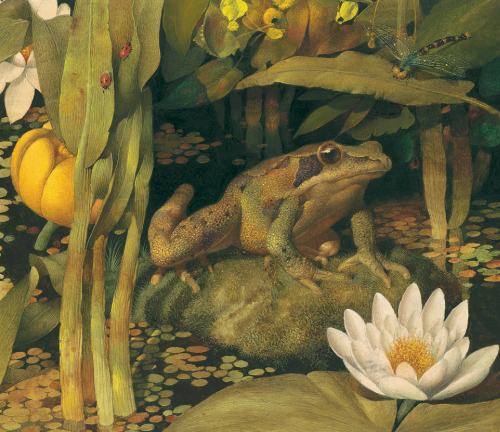 “Bursting with detail,” Pamela Paul wrote in the aforementioned NYT link, “especially in the opulent end pages, Spirin’s tableaus of blooming lily pads, laden with flowers and frogs, resemble 17-century Dutch still lifes in their awed contemplation of the natural world. Textures snap to life….” These are splendid, realistically-rendered tempera, watercolor, and pencil illustrations, and they reward with intricate details those willing to spend time with them. A beautiful piece of nonfiction. FROG SONG. Copyright © 2013 by Brenda Z. Guiberson. Illustrations copyright © 2013 by Gennady Spirin. Published by Henry Holt, New York. 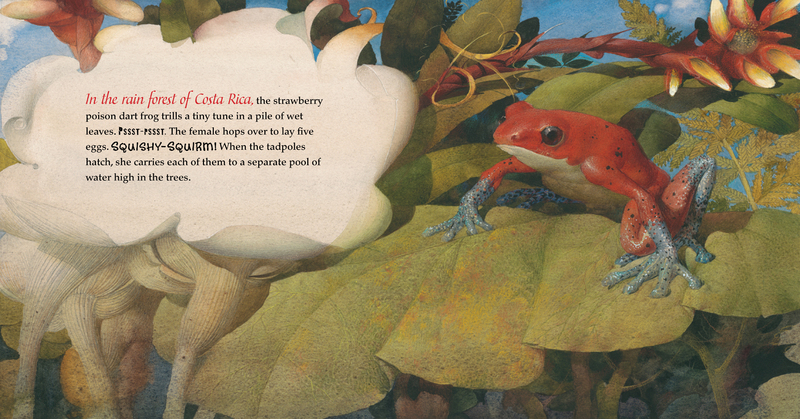 Spreads reproduced with permission of the publisher. 1) In celebration of this news, I’m re-watching all three seasons of Arrested Development. Now, understand: I don’t re-watch television series or movies, generally speaking. Life is too short, and there are too many books I want to read and movies I want to see. But it’s only one of the funniest shows in the history of television, and I wanna be prepped for the new shows. Plus, I really missed Buster. 3) I did story time with toddlers yesterday, which was fun. But part two of the kick was being reminded how glad I am that I’m no longer chasing toddlers around. Those parents. They NEVER get to sit. 4) A great, new read-aloud with my girls. None of us can get enough of Christopher Healy’s The Hero’s Guide to Saving Your Kingdom, which I first read about at this great Horn Book link. And it looks like we found it just in time for the sequel. 7) Look at this. I better go build a syllabus. Frog Song looks sublime. Thanks for the post, Jules. And it’s fast food that does him in. As gulch-grass in arroyo shade. Burns up blacktop in his sleep. Speed so quick, no gun can clock it! Cronks his parting words—Beep, Beep! Wow! 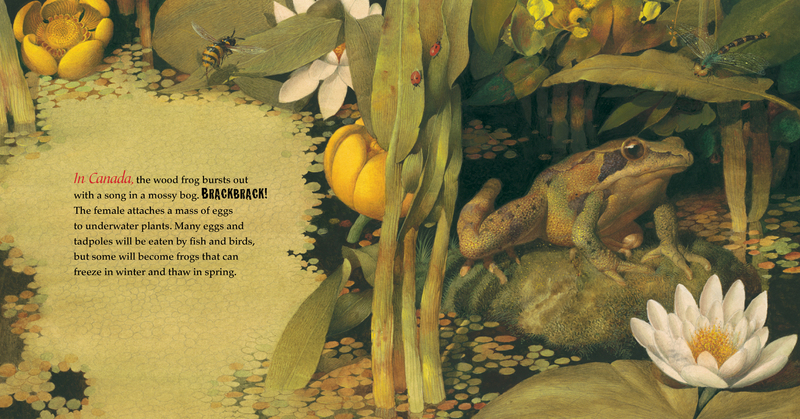 Lovely frogs, hooray for Spring and interesting nonfiction picture books! Jules – AD might be just the thing to fill the 30 Rock hole in my life. Congrats on the class, so exciting. My nieces and nephews who were visiting last week were a good reminder that I am glad that I have kids who can buckle themselves into the car without car seats. Steven – What a lovely ode to two of my favorite characters. 1. I decided to post a sketch for everyday of April. I am using the hashtag, #aprilsketch. You can find me on twitter (atlanticmoira) or instagram & tumblr (atlanticmo) if you want to follow me. 2. My son’s little leauge team started practicing (first day 38F out). Go Red Sox!! 3. Yesterday I went up to the Harvard Museum to meet up with a bunch of kidlit illustrators to sketch some of the very cool collection. We had lunch afterwards where we exchanged sketchbooks and chatted kidlit. 4. I am an aunt for the seventeenth time thanks to my SIL in NY. 5. The Easter candy is consumed. 6. Got to see my good friend who lives far away but was home in MA to visit her folks. Happy Spring! We’ve got the state of mind even if we don’t have the weather…yet. Love the squizzle-squizzle of the frogs and art. Jules, how did your talk go last Monday? Class this summer, woohoo! I so agree about re watching movies and tv shows. Haven’t seen AD. Steven, the pairing is terrific. Burns up blacktop in his sleep, ha! Moira, will check out you sketches and hope you get spring weather soon. 3. Posting student work on my blog. 5. Wrote a synopsis for my novel. 7. Poetry postcards to send out. Steven, I love that. I’ll have to go look up the rules for bifurcated odes so that I can appreciate it even more. Moira: Hope the weather soon follows your positive state-of-mind. Happy new aunt-hood, and kick #3 sounds very fun. Thanks for the info on your sketch-a-day. Jone: The talk went well, and it was also a good chance for me to experience again the software I’ll be using to teach. And you wrote a synopsis for YOUR NOVEL? Whoa. That is exciting and intense, but mostly exciting. Hello, Gennady! Thanks for the beautiful frogs and friends. What lovely details. Jules: Who wants to sit still? Good morning, Jone. Keep writing. Oh, Jules, so glad you highlighted Frog Song today allowing me to look at it with fresh eyes. I did a post last month on my blog. I’m happy spring has arrived for you. Still waiting here though; had another bit of snow this morning covering our ground yet again. Your class looks divine. Thank you Steven for the poems about Coyote and the Road Runner. No Saturday morning was complete without watching them. Absolutely lovely sketches Moira. I’ll be checking them out this month. Thank you. I like the idea of poetry postcards Jone. What a wonderful idea. 1. I saw my first robin. 2. When I overslept for garbage pick-up; the man called from farther down the route, came back and backed into the drive so I would not have to take everything to the edge of the road. Knights are everywhere. 3. Made dinner for Nerdy Book Club friends who were in town. 4. Xena is going to be in a short video. Our posts crossed in cyberspace but I love your last kick. Nothing is better than laughter. A quick good morning Imps! – I’ll come back later and comment on everyone’s kicks but headed out to Boot Camp – but Jules – Tift Merritt? I’d never heard of her and then clicked over and listened to Traveling Alone and man, just perfect. Struck a chord, I just went on vacation alone and had a conversation with a good friend about there being a certain romance in solitude….synchronicity! Wow! LW: Touché, my friend, touché (on wanting to sit still). … Hope the read-through was for a particularly great show. Margie, what a good week. Congrats on the first robin-sighting. I hope you get Spring very soon. I love your second kick. Also, I’ll go find your Frog Song post. Rachel: I LOVE THAT SONG (“Traveling Alone”). In fact, what happened, though I’ve always liked Tift’s music, is that her latest CD, a collaboration with a classical pianist, made me want to go get some of her older CDs (Tift’s, that is) that I didn’t already have, and the one that opens with “Traveling Alone” is the one I got. And I instantly loved the song — especially the lyrics. So glad you like it too. I’m going to have to list 7-Imp itself as my only Kick today, although it wasn’t my only Kick this week: I’m flat out of time to post Kicks THANKS TO TODAY’S ILLUSTRATIONS. And I just blew all my available Kickstime, possibly for the entire month of April, on a search — in vain! — for any information about it ANYWHERE. Have set up a couple of rare/used-book alerts but am not hopeful. But it was fun remembering it. Gennady Spirin’s frogs reminded me SO much of the pictures of frogs and toads in this book! All of which said, I am looking forward to reading everyone else’s Kicks today! This is a top shelf book for sure. Such gorgeous nonfiction. 1. Finished a rather long article. 2. Good feedback on said article–working on rewrites. 3. Realized that four of my students are now reading with expression…such a jump for them! 5. New yarn! New yarn! From Maine. showing Ashley Bryan during the Easter morning installation of his amazing beachglass stained glass pieces. 7. My cat Spike, who likes to sleep on top of me when I nap. 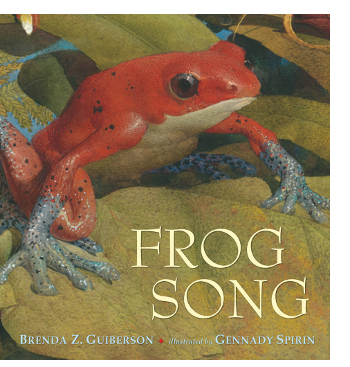 Frog Song looks gorgeous, Jules! Now I have run out of time to actually enjoy people’s kicks and respond…so will leave myself a note to NOT FORGET when I return home from work. I have never watched Arrested Development, Jules. And you’re a teacher for that course?! Wow! Have fun! 1. Have cleared out lots of space in the spare room (ie new baby’s room) including piles of books. Hard to decide what to let go of but it’s so much emptier now that I feel very accomplished. 2. Had fun collecting paint swatches – even if it’s hard to decide which ones to go with! 6. The free-range pork people had a 5 day old piglet with them. It was ridiculously cute. Thanks, all, for the kind words about the poem. Jules: “bifurcated ode” is just my way of saying an ode branching in two directions. Now those are some beautiful frogs—mottled skin, glossy eyes, sticky eggs. I’ve always liked frogs. Back in my 20s, when apartment rules allowed aquarium-pets only, I had two African Dwarf Frogs who were my pals for many years. And Spirin seems to have picked some very interesting species to profile; like the one who lives with a tarantula. (!) Thanks for sharing. Stephen – thumbs up for your refrain “And it’s fast food that does him in.” ha-ha. Moira – your baseball-play shorthand gives you away as team Scorekeeper. Have a good season. Jone – RE: novel. You go girl! LW – glad new photos turned out well. A good headshot is worth a thousand promo words. Margie – love your “knight in shining garbage truck” anecdote. Made me smile. Rachel – synchronicity happens @7-Imp. Me thinks: Jules has a knack/we all have lot in common. JES – Hope your rare/used book alert hits. Do you recall who gave you the book gift? Robin – Congrats on finished article and emotive student readers, and Spike naps too. emmaco – Good luck on the baby learning curve. Did you know babies use their own (dye-, scent-free) brand of laundry detergent? I didn’t. For anyone who has a HS school senior in their household, this is Decision Month (theirs). With list of the colleges they’ve been admitted to, they have until May 1st to decide/deposit. So, my son and I have been touring his list of undergrad film schools. 1. Univ. of North Carolina School of the Arts has their own Film Village with soundstages, backlot architecture and studio facilities. Their film department funds all aspects of the students’ productions: props, film stock, lighting/camera equipment. The grad-student composers even write film scores which the musician students perform/record. Wow. You folk in North Carolina have quite the gem in your backyard. 2. Emerson in Boston… happy students, great facilities and location (right on Boston Common.) But the student living perk that made me gasp was this: you can look up the laundryroom online and SEE how many washer/dryers are free. AND then have your washer/dryer TEXT YOU when your cycle is complete (!). OMG, how many dank, lint-filled, tumbling hours might I have saved! 3. youthful enthusiasm; the world is their oyster. 6. twin-bed lifts (that allow extra storage beneath), cool invention. 7. my son spreading wings on edge of the proverbial nest; thoughtful and competent. Have a great spring week kickers and lurkers and Jules. Thanks for the springy frogs Mr. Spirin. Ooh, Robin! Thanks for the video! And I knew you’d knock that article outta the ballpark. Emmaco, baby prep! Exciting. Glad you successfully cleared out some space; it’s so hard to do, but—as you said—feels great afterwards. Thanks for the link, Steven. Hi Imps, back after a busy, really busy, time. Loved all the frogs – so, so cool. My Little will like this book a lot!!!! I really enjoyed all the kicks – everyone is inspiring. AND I’m so happy I was able to stop by on a day when Steven had posted a poem – great as always! 1. beautiful weather (70s) for a farewell for lovely friends moving to Amsterdam. 2. a chat with my conference planning buddies today – so creative, so out there, so loving. Can’t wait for August in Maine. 3. foster baby is recovering from a week-long digestive challenge with a formula that hurt her tender little innards. Phew! Less screaming, slightly more sleep, some sanity! 4. my Little said “YAY!” when I reminded him at dinner that he goes back to kindergarten tomorrow after having been off for 2 weeks. I’m so grateful he is happy at his beautiful little school. 5. Just finished the latest Flavia de Luce novel – I love that girl! 6. weeded the herb bed while my Little drew the most wonderful chalk drawings of Thomas (the tank engine) and his friend Hiro. 7. had time to make it here to read and share. Good luck with your book search, John! That book sounds fantastic. You’re an aunt 17 times over, Moira?! Wow! You should be called super aunt! Glad your foster baby is feeling better, Allison – at least you figured out what the problem was. Jules (et al. ), my parents gave me the book one Christmas. I can remember reading it in bed for HOURS during that Christmas break. Laughing. So underrated in yearbooks. And I hope you find that book. JES: That is fantastic. Thanks for sharing. Good luck with the book hunt! I’m soo scared of posting this comment right now. Reading through comments after each post in this blog makes me see a very tight knit community amongst you guys. For now, I shall continue lurking around and appreciating every post and wonderful comment I read on here. No kicks for now. Next week, perhaps.